Within walking distance of top tourist destinations, such as the British Museum and Oxford St, close to the mainline stations of Kings Cross, St Pancras and Euston, and the British Library, and in the heart of the University of London campus, Russell Square is one of the squares of London that is well known to visitors to the capital. Although many of the buildings surrounding the square are no longer homes, its shady lawns are well used on a daily basis by students, tourists, and local workers and residents. It is one of the largest squares in London (with its own Tube station), so there’s room for everyone, with a cafe terrace on which to watch the world go by on a sunny day. The west side of the square is dominated by the large white University of London Senate House, while on the east side is the imposing late 19th century Hotel Russell. Next to it once stood the equally imposing Imperial Hotel; it is still a hotel but now housed in a late 20th century building. The sign to the long-gone Turkish Baths can still be seen on the pavement. A few original town houses remain on the south side. Some buildings around the square bear plaques with information on earlier residents. A cab shelter, originally built for the drivers of hansom cabs, still stands in the north-west corner. Russell Square was designed as the centrepiece of the 5th Duke of Bedford’s early 1800s development plan for northern Bloomsbury (Russell is the family name). James Burton, the builder of many of the squares in Bloomsbury, created a link between Russell and Bloomsbury Squares in the form of a central axis along Bedford Place. Humphrey Repton, the famous garden designer, completed this visual link by terminating the view in each direction with statues of the Duke of Bedford (in Russell Square) and his friend the Whig politician and opponent of the slave trade, Charles James Fox (in Bloomsbury Square). It is one of only three London squares designed by Humphry Repton and its refurbishment in 2002 retained or restored many of its original design features, including the horeshoe-shaped path and the lime walk. 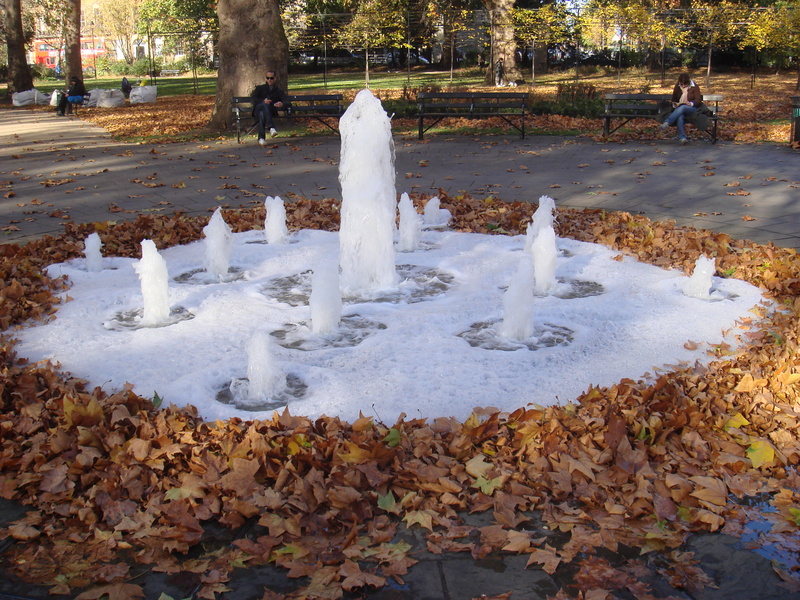 The gushing fountain, which animates the centre of the square and is much loved by paddling children, was added. The square is listed grade II by English Heritage. It is protected by the London Squares Preservation Act of 1931 and lies within the important Bloomsbury Conservation Area. Russell Square is owned by the Bedford Estates and maintained by Camden Council . It is open to the public during daylight hours.